”Smaller, lighter, brighter, sharper” the Opticron Traveller BGA ED breaks new ground for 32mm field binoculars aimed at the enthusiast and serious user. Measuring 119 x 115mm and weighing just 450g, the all-new optical system delivers wide field 8.2° (8x32) and 6.5° (10x32) with unparalleled cross-field resolution, light transmission and colour correction. Opticron Traveller BGA ED binoculars are supplied in a neoprene soft case with rainguard, neoprene strap and rubber objective lens covers. Impressive Optical Quality and Size! The optical quality is seriously impressive - it's a close match for my Zeiss binos, but with a much wider field of view, and a much smaller, lighter body. Resolution, colour neutrality and image brightness are all top notch. Contrast is good, but not outstanding. Optical quality is maintained across a very large part of the field of view - the sweet spot is very large. Eye relief is generous and eye positioning not critical. To have this level of optical quality in a compact, lightweight bin is fantastic. After a month of solid use, this is definitely my favourite pair of bins - I use it more than my Zeiss 8x42's! Minor gripes - the fit and finish of the rubber armouring is a bit 'lumpy' and loose on my model - the eyepiece is so large that I occasionally get crescent glare at the bottom edges in bright conditions - the neck strap and rainguard are a bit low-rent for such a seriously good binocular. Overall, Opticron have a winner on their hands with this design though! I might even be tempted by the 10x32's! An "alpha" view for a sensible price. Very pleased, and surprised, by such an outstandingly clear, crisp, bitingly sharp view. 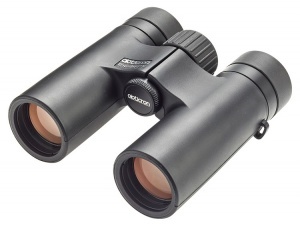 Has to be the best compact sized carry everywhere binocular I have seen. Lovely huge wide view. Fingers wrap nicely around the slender barrels. Perfect weight. I'm a +6.5 glasses wearer and comfortably see the whole view with one click out of the eye shields. The lens coatings are wonderful, they add a brilliant vibrancy to a dull scene. I can't get over how bright they are, and that's coming from a previous Swarovski 7x42 SLC neu.